The Electrical Contractor Network is committed to providing Information and Services for, and about the Electrical Industry. Major goals of this website include promoting safety, and emphasizing the importance and value of using a Licensed Electrician. 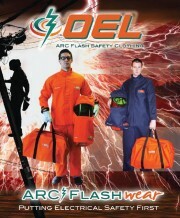 Work Gear for Electricians and the Trades - Arc Flash Clothing, Gloves, KneePads, Tool Belts, Pouches, Tool Carriers, etc.